November - spring flowers! Such a great time for a wedding. For this couples cocktail style wedding at MONA the bride asked for colour. Music to my ears! And there is so much colour to play with in November. 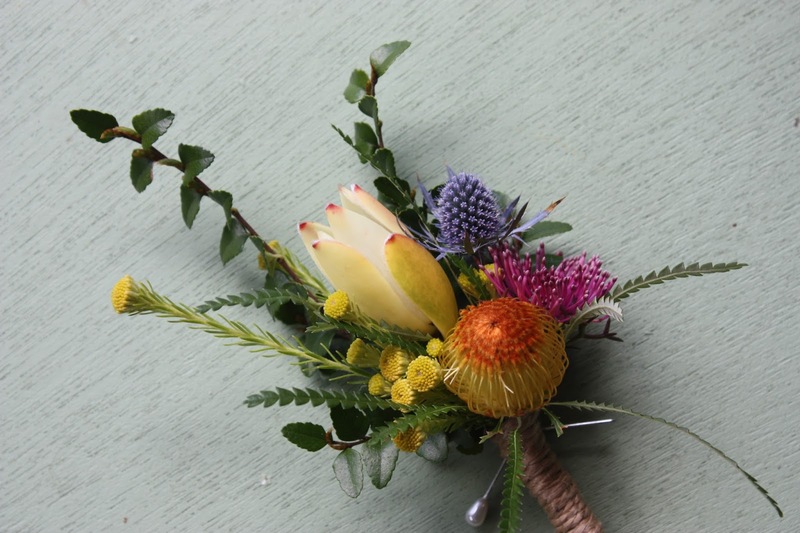 The bride's bouquet was a combination of waratahs, banksias, proteas and pincusions. NSW Waratahs (Telopea Speciosissima) are readily available in Tasmania in November. They are such a goregous showy flower in a range of rich reds. I also used red Banksia Coccinea. The first Pincushions (Leucospermum) of the season were just starting. They are called Mardi Gras and have yellow styles with red ribbons, and silvery furry little tops. I also used some Berzelia, a gorgeous spring texture plant with creamy white/green balls. 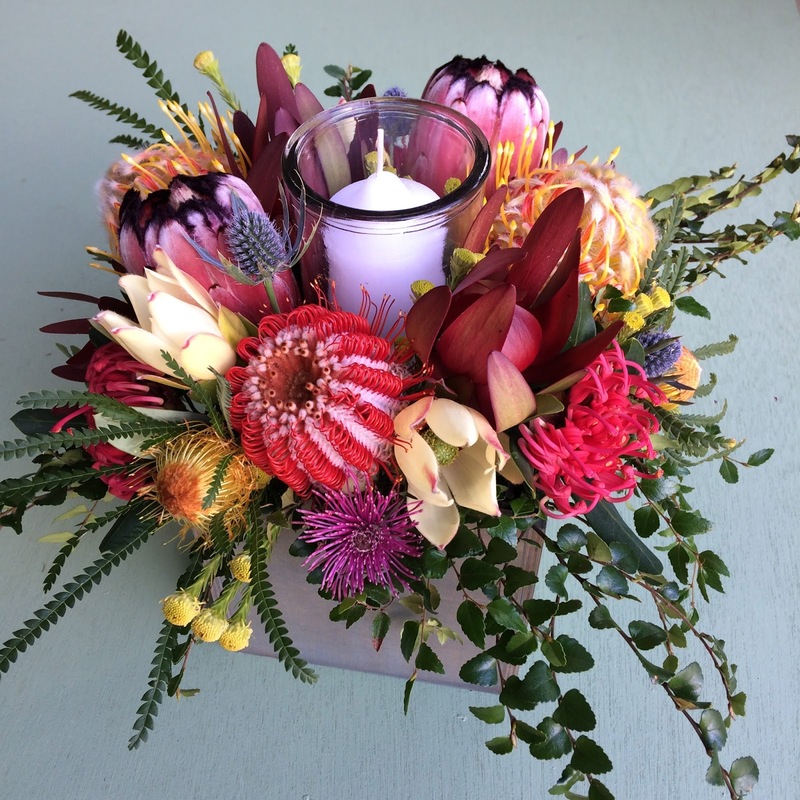 I also used a Pink Protea with black fringing called Satin Mink, which flowers in spring and autumn. Blue Sea Holly took us to the cooler end of the colour spectrum. Purple Isopogon or Cone Flower are a gorgeous spring flowering Australian native that I also added. 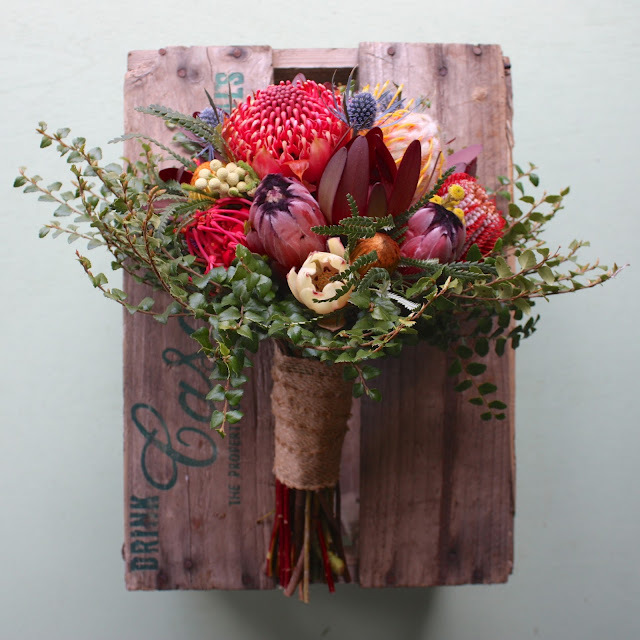 The foliage used is a Tasmanian native rainforest plant - Myrtle Beech. For the groom, there were spring Leucadendrons - a female Discolour Leuco, creamy white with pinkish tips, and the yellow cones of Golden Fireworks. A purple Isopogon, blue Sea Holly, and a golden, shiny Dryandra/Banksia Formosa which as well as its distinctive flower has gorgeous zig zag leaves that sprout out at fun angles. Its a joy to play with fresh spring flowers in such happy colours! For the simple table decorations the bride decided on wooden box arrangements with candles to light for extra atmosphere. 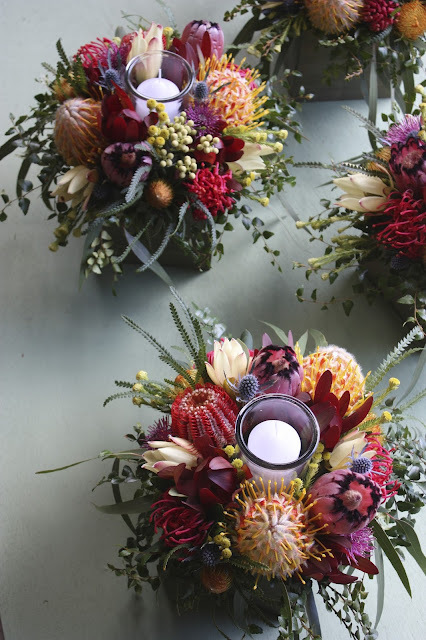 For the boxes, the main flowers used were Banksia Coccinea, Protea Satin Mink, Mardi Gras Pincushions, and Tasmanian Waratahs (Telopea Truncata). Leucadendrons used were female Discolour, Safari Sunset and Golden Fireworks. Other flowers were blue Sea Holly, Dryandra/Banksia Formosa, and Isopogon Formosus, with Myrtle Beech foliage. There are some who think that "native flowers" mean "brown" .... but I think you'd agree this is far from colourless and drab. Lastly, we did a great big bunch, using the same flowers as the bouquet to use for a vase at the reception room. It was such a fun wedding to work on, and a treat to be involved! This is outstanding. I am so impressed form your work. Keep sharing. Thank a lot. My name is Grace. I grow proteas and native flowers at Swallows Nest Farm on the beautiful Tasman Peninsula in South Eastern Tasmania. Please ask for permission before using any of my images, and make sure you acknowledge that they're from Swallows Nest Farm. It will only take a minute and you know its the right thing to do. Thank you! Visit Swallows Nest Farm's profile on Pinterest.